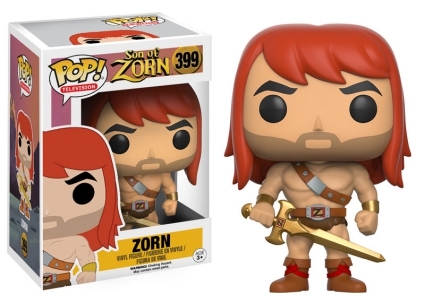 Zephyria’s best warrior gets stylized with 2016 Funko Pop Son of Zorn. The set offers multiple versions of the show's main character. Son of Zorn follows Zorn after he travels to Orange County, California in hopes of establishing a connection with his ex-wife Edie (Cheryl Hines) and their now teenage son Alangulon, a.k.a. Alan. The comedy series is live-action with the exception of Zorn, who is animated. 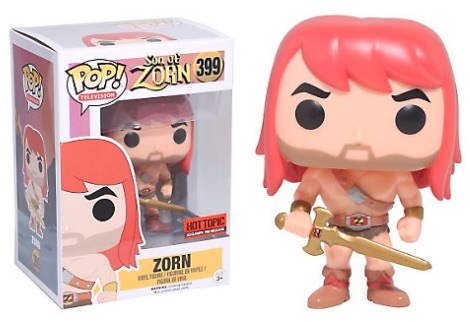 Voiced by Jason Sudeikis, Zorn resembles He-Man. This includes carrying a sword at all times while preferring to not wear pants. 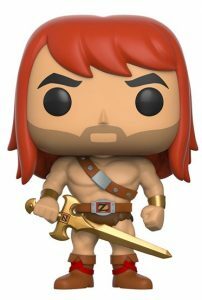 Funko Pop Son of Zorn reflects the humorous style of the Fox warrior with three different options. The main figure shows a bare-chested Zorn in his natural Zephyria warrior pose, wearing his sword harness, fur (?) shorts and boots while grasping his sword. 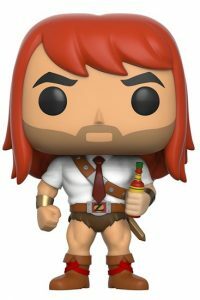 The second vinyl figure is posed with the harness over a white shirt and tie, yet Zorn is still only wearing shorts and holding a bottle of hot sauce. 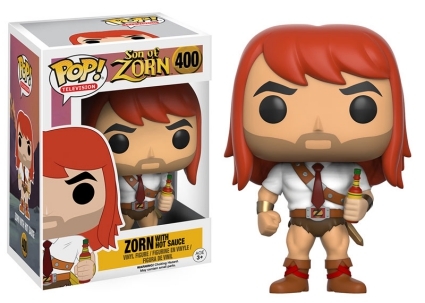 Lastly, collectors can find Zorn in his office attire with a chalice in hand at Hot Topic outlets. Hot Topic also has a pre-release version for the main Zorn figure (#399). Standing approximately 3 3/4” tall, all three figures feature his red-orange hair along with gold bracelets. Part of the Pop! Television line, figures #401-403 are missing from the Funko Pop Son of Zorn checklist which could indicate other exclusives in the future, but that has not been confirmed. Funko POP! Son of Zorn New Sealed!